Dr. Albert Alley, director of World Blindness Outreach, and six villagers who received free cataract surgery during the mission. We heard and said these words many times on our recent medical mission to Apam, Ghana, 4-11 May. We heard them from the 87 patients who received cataract, pterygium, or glaucoma surgery, and from the patients’ family members, hospital personnel and administrators, and village elders. And we said them to everyone who worked so hard to make our trip a success, and to the patients who trusted us with their eyes and their hopes for better vision. The goal of the mission was “to treat preventable and correctable blindness and eye disease.” Rotarians from District 9100 (Ghana) and 7390 (Pennsylvania, USA) spent 11 months organizing the trip in partnership with World Blindness Outreach. The medical mission involved two Rotary districts and five Rotary clubs (Accra, Apam, Lebanon, Manheim and Lancaster Sunrise) working with World Blindness Outreach and host ophthalmologist Dr. Boateng Wiafe. The entire team was pleased this first mission to Apam was successful. 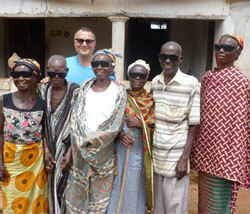 Because of our mission, all six were able to receive the surgery at no cost, and to regain their sight. The brother was so happy with the surgery on his first eye that he begged to have the second eye done. As we were taking photos of our patients, many of their neighbors came to help celebrate. They were all jumping up and down chanting their “Medase!” (“Thank you!”) You can see this on a video we uploaded to YouTube. We were struck by the writing over the family’s front door: “Oh! I’m alive.” The conditions of the home and the village were so modest that it is hard to imagine the difficulties of life there. How wonderful and humbling to know that we were able to ease some of the struggles. This entry was posted in Fighting disease and tagged Ghana by Rotary International. Bookmark the permalink.